I’m always amused when someone says to me, Oh, your gardens are so pretty. It must take a lot of time…. The reality is that while those same people are mowing, watering and edging their pointless lawns, or hiring some company or individual to do so, I’m sipping my coffee, or whatever, and enjoying the native plants in my gardens–as are the wildlife who are attracted to those plants. 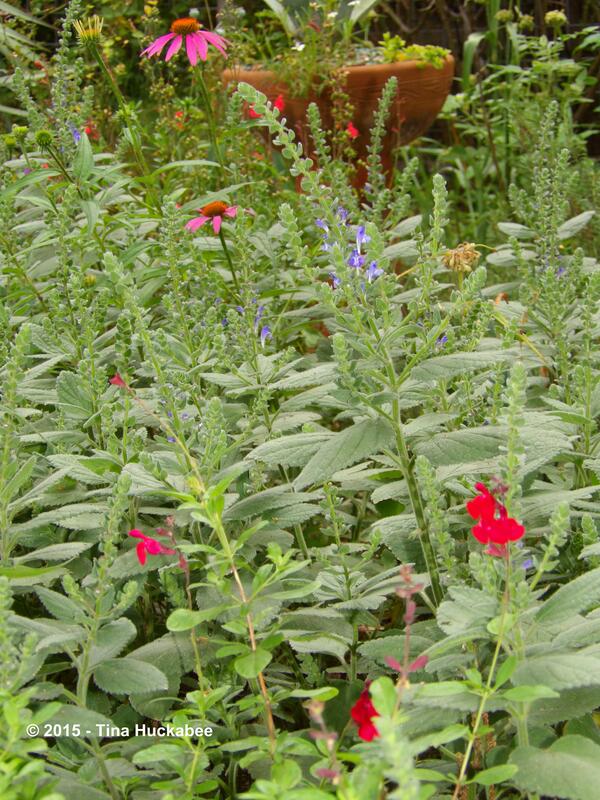 Wildflower and native plants gardens are beautiful and require less work than traditional “yards” of turf. Additionally, wildlife of all sorts will visit and set up house–because they evolved with natives and generally prefer native plants above others. Gardeners who plant with natives and wildflowers, instead of introduced plants or turf, help heal the Earth. A well-designed native and wildflower garden is a balm to the gardener, to people who visit the garden and to wildlife which is threatened by habitat destruction. 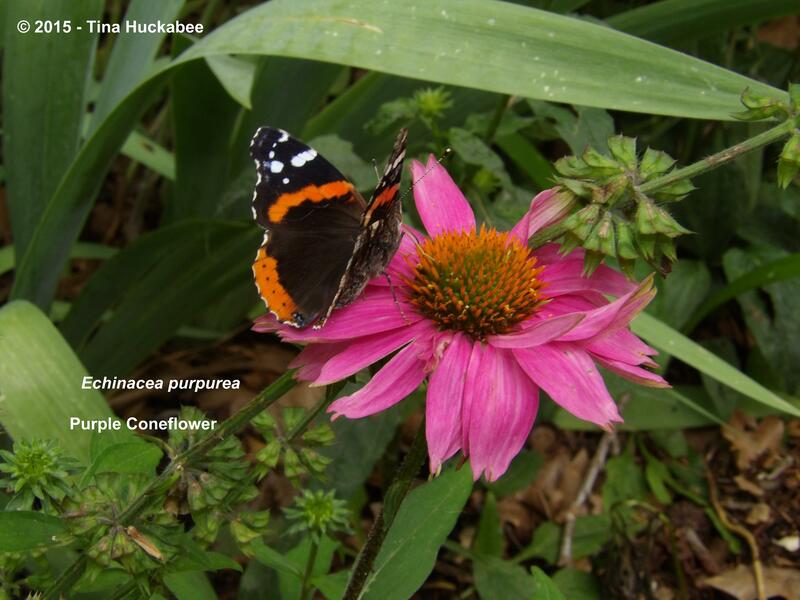 Celebrate National Wildflower Week and plant some wildflowers in your garden. Heck, just make your whole plot of land native plants and wildflowers. Wildflowers work: they’re beautiful, easy, and support wildlife. 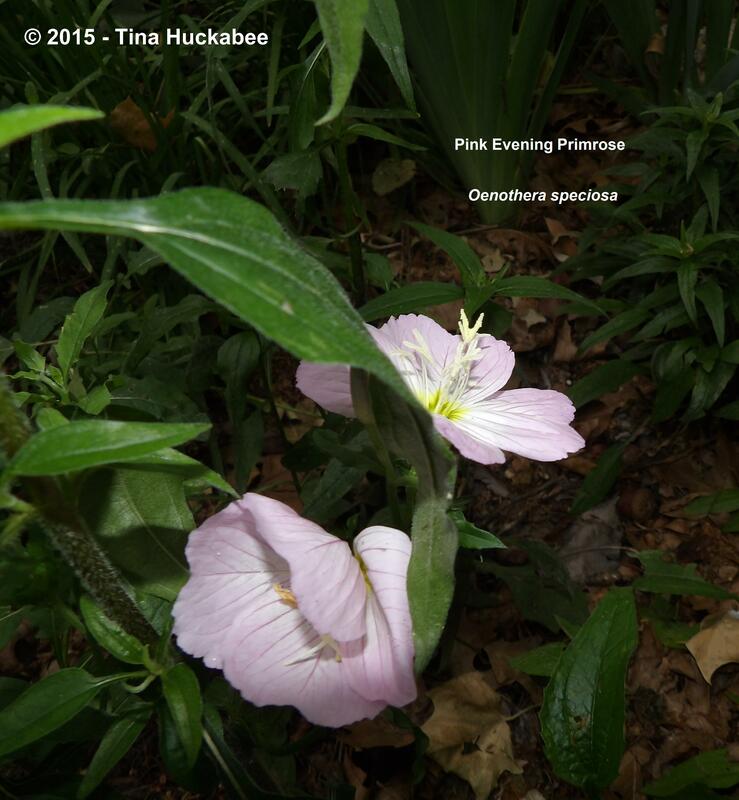 This entry was posted in National Wildflower Week and tagged Echinacea pupurea, Oenothera speciosa, Pink Evening Primrose, Purple Coneflower by Tina. Bookmark the permalink. Wildflowers do work, and with the rare exception, when I stick to buying native plants in pots or seed form, I find my success (and confidence) as a gardener multiplies accordingly. Add to that the joy of attending to plants constantly drawing in birds, bees and butterflies, well it doesn’t get much better. Growing tomatoes in Texas, now that is work. 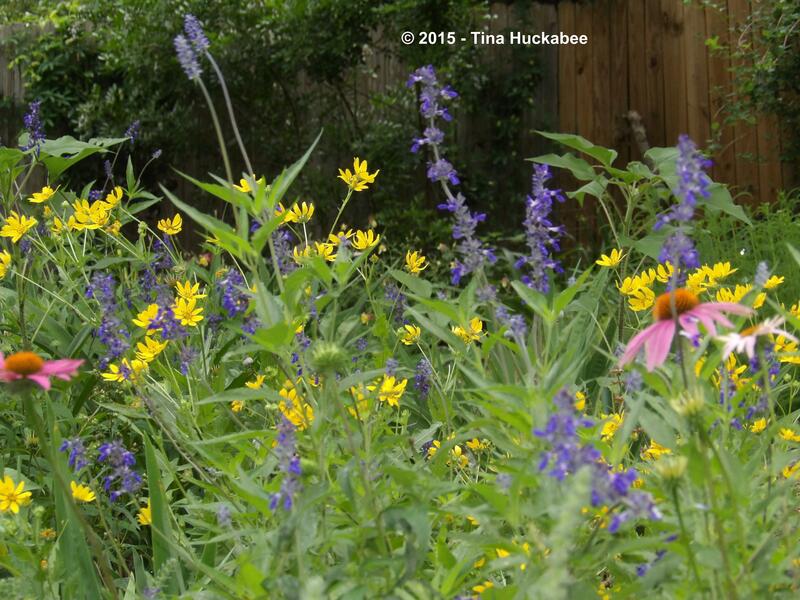 Growing native wild flowers is anything but! Yup, to all of the above! There still is this notion that native gardens are “messy” and “too wild” and of course, they can be that, if not cared for–but so can any other kind of garden. To me the selling points of using native plants is their ease and beauty for the gardener and the attraction to those plants of fascinating and diverse wildlife. Totally agree! What are the tall purple flower stalks in the first photo? I like how they’re breaking up the rest. That’s a Salvia farinacea, ‘Henry Duelberg’–a great plant for this area–bees and butterflies love it and I’ve seen finches when the seeds are ready. Hardy and tough, it has a long blooming cycle in spring, a little rest during the heat of mie-late summer, and blooms up again in fall. Nice! Thanks! I’m just starting to rip out grass for flowers (had to finish ripping it out for veggies first) and can’t seem to have enough variety of reseeding native flowers. We haven’t a national Wildflower week here Tina, so I am joining in with you in spirit and will campaign to the powers that be for one here! We do have a campaign “Say No to the Mow” though, encouraging folk to stop mowing their lawns or even a small part of it and seeing what wildflowers are naturally in the lawn. I think that’s just great, Julie! I like the “Say No to the Mow”–is it working? Are more people inclined to put in gardens and remove turf? “Say No to the Mow” is about road verges too and thats where its been most successful. Local councils are leaving these areas for wildflowers and wild grasses to flourish and it looks spectacular. And cutting only once later in the year. There is a fast growing interest in wildflowers here, largely thanks to charities like Plantlife but I can’t imagine a lot of folk removing their lawns. There is a similar obsession here with monoculture as you have over there. Plantlife the organisers of this campaign are encouraging people to at least leave some of their lawn long so any wildflowers can grow. Its early days though and hopefully more folk will grow more plants for pollinators and less monoculture grass. Your garden looks great – I agree with your approach! Thanks! It’s a method that everyone can garden with. Truly, the biggest obstacles are nurseries that don’t supply native plants. Easier and more rewarding to go with natives, I’m planning a wildflower post for Friday, still wildflower week! Well done for encouraging people to plant wildflowers. Your native plants look very exotic to me. Ha! One gardener’s weed is another’s exotic find–so it goes in the gardening world. The first time I visited Kew, I saw a Lantana (probably L. urticoides) which is a native plant and so boring and common here in Texas. But at Kew, it was in a prominent spot in one of the greenhouses. I chuckled at that, but it’s true that gardeners always prize and appreciate plants from around the world. I just think we should also prize our own beautiful wildflowers, common to our place in the world.